For a full listing of computer's color palettes, see List of palettes. Computer systems that use a 4-bit or 8-bit pixel depth can display up to 16 or 256 colors simultaneously. Many personal computers in the early 1990s displayed at most 256 different colors, freely selected by software (either by the user or by a program) from their wider hardware's RGB color palette. Usual selections of colors in limited subsets (generally 16 or 256) of the full palette includes some RGB level arrangements commonly used with the 8-bit palettes as master palettes or universal palettes (i.e., palettes for multipurpose uses). These are some representative software palettes, but any selection can be made in such type of systems. For specific hardware color palettes, see the List of monochrome and RGB palettes, List of 8-bit computer hardware palettes, the List of 16-bit computer hardware palettes and the List of videogame consoles palettes articles. Each palette is represented by an array of color patches. A one-pixel size version appears below each palette, to make it easy to compare palette sizes. For each unique palette, an image color test chart and sample image (truecolor original follows) rendered with that palette (without dithering) are given. The test chart shows the full 8-bit, 256 levels of the red, green, and blue (RGB) primary colors and cyan, magenta, and yellow complementary colors, along with a full 8-bit, 256 levels grayscale. Gradients of RGB intermediate colors (orange, lime green, sea green, sky blue, violet and fuchsia), and a full hue spectrum are also present. Color charts are not gamma corrected. These elements illustrate the color depth and distribution of the colors of any given palette, and the sample image indicates how the color selection of such palettes could represent real-life images. These are selections of colors officially employed as system palettes in some popular operating systems for personal computers that support 8-bit displays. 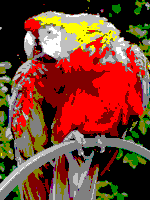 Used by this platform as a roughly backward compatible palette for the CGA, EGA and VGA text modes, but with colors arranged in a different order. Also is the default palette for 16 color icons. In 256-color mode, there are four additional standard Windows colors, twenty system reserved colors in total; thus the system leaves 236 palette indexes free for applications to use. The system color entries inside a 256-color palette table are the first ten plus the last ten. In any case, the additional system colors do not seem to add a sharp color richness: they are only some intermediate shades of grayish colors. When Apple Computer introduced the Macintosh II in 1987, this 16-color palette was included in System 4.1. 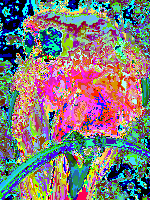 These are selections of colors based in evenly ordered RGB levels which provide complete RGB combinations, mainly used as master palettes to display any kind of image within the limitations of the 8-bit pixel depth. Having six levels for every primary, with 6³ = 216 combinations. The index can be addressed by (36×R)+(6×G)+B, with all R, G and B values in a range from 0 to 5. Intended as homogeneous RGB cube, it gives six true grays. Also there is room for another sorts of 40 colors, so operating systems or programs can add extra colors. Apple Macintosh 256 color default palette, it also contains four gradients of ten shades each for gray, red, green and blue. This palette is constructed with six levels for red and blue primaries and seven levels for the green primary, giving 6×7×6 = 252 combinations. The index can be addressed by (42×R)+(6×G)+B, with R and B values in a range from 0 to 5 and G in a range from 0 to 6. The same case as the former, but with an added level of green due to the greater sensibility of the normal human eye to this frequency. It does not provide true grays, but remaining indexes can be filled with four intermediate grays. In any case, there is little room for any other color. This palette is constructed with six levels for red, eight levels for green and five levels for the blue primaries, giving 6×8×5 = 240 combinations. The index can be addressed by (40×R)+(5×G)+B, with R ranging from 0 to 5, G from 0 to 7 and B from 0 to 4. Levels are chosen in function of sensibility of the normal human eye to every primary color. Also, it does not provide true grays. Remaining indexes can be filled with sixteen intermediate grays or other fixed colors. In fact, this is the best balanced RGB master software palette, in a compromise between the RGB arrangement based in the human eye's sensibility and a sufficient remaining palette entries for another purposes. This RGB software palette occupies the full 8-bit range of possible palette entries, so there is no room for other fixed colors. Software using this palette must draw their user interface elements with the same colors used to show pictures. Also again, it does not provide true grays. Used to display pure grayscale TIFF or JPEG images, for example. 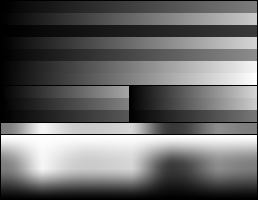 Palettes made of a continuous color gradient from darkest to lightest arbitrary hues. The pixel data is treated as if it were grayscale, but the color table plays with RGB color combinations, not only gray. The relationship between the original luminance and the mapped one can vary, but the lighting scale is preserved along all the palette entries. One very common case of such palettes is the sepia tone palette, which gives an image an old fashioned and aged look (left). Another gradient example, based on blue hues, is presented here (right), but any hue or mixing of hues can be used. Many cell phones with built-in cameras have options to take colorized photos using this technique. Note, in the example above, that new details can be seen as blue over magenta in the background's dark areas of the original photograph. 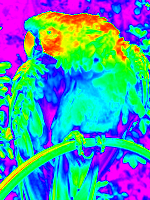 There exist many false color palettes, some of them standardized, used mainly in scientific applications: astronomy and radioastronomy, satellite land imaging, thermography, study of materials, tomography and magnetic resonance imaging in medicine, etc. ^ The Palette Manager: How and Why It Does What It Does, the article is in Windows Write file inside self-extracting archive.